Chemists and engineers today are very interested in a kind of nanotechnology enabled by tiny islands of nanoparticles called "colloidal nanocrystals." They can be made out of abundant and non-toxic materials, and they can be easily tweaked to have a number of different properties as a function of their size. Depending on how they're built, colloidal nanocrystals could be made into solar panels, electronics or optical devices. But all of these applications require making nanocrystals friendly places for electrons to travel along. The team focused on the links between nanoparticles. At first, scientists used organic molecules to link them, but these tended to block the movement of electrons. Some recent experiments have seen much better results for inorganic molecules instead, but no one was sure why. 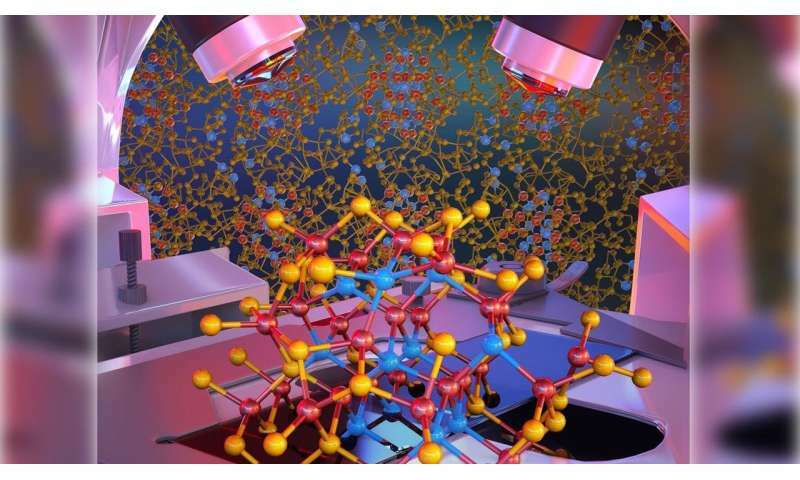 "We never had an atomistic model for the behavior of these inorganic linkers," said study co-author Giulia Galli, the Liew Family Professor of Molecular Engineering and professor of chemistry at the University of Chicago and a senior scientist at Argonne. Galli worked with colleague Dmitri Talapin, the Louis Block Distinguished Service Professor of Chemistry and a scientist at Argonne, as well as Stefan Wippermann, group leader at the Max Planck Institute, to explore the structure of nanocrystals made with these inorganic links. Through a combination of theory and experiment, the team puzzled out the blow-by-blow of actions. It turns out that the linker molecules react where they're attached and form a sort of glue, which affects the properties of the nanoparticles. "Instead of each having separate identities, the whole thing should really be considered as a complex nanomaterial," Galli said. "This was totally different from what was thought." "The complete model of the structural properties of the nanoparticles should help scientists and engineers as they try to design materials for better and less toxic electronics, solar panels and more," said Wippermann, who led the study. "The computational machinery developed during this study is rather unique and should be applicable to a broad range of nanostructured materials containing both crystalline and amorphous components," said Talapin.